More commonly known as the greatest artist in the history of mankind, Leonardo da Vinci was also a magnificent philosopher and scientist. The most influential figure in the Italian Renaissance, Leonardo is widely considered to be an inventive multi-genius. Countless sketches describe that Leonardo had found out the basis for many inventions that were understood hundreds of years after his death. Born on 15 April in 1452 in Vinci, Italy, Leonardo was the illegitimate child of Ser Piero da Vinci, a notary, and Caterina, a country girl. He stayed with his father’s family and they moved to Florence when he was just 12. At the tender age of 14, Leonardo started out his artist’s apprenticeship at the studio of Andrea del Verrocchio (1435-1488), an Italian sculptor, goldsmith and painter. The young Leonardo earned a place into the painter’s guild in 1472 when he was just 20 years old. At 26, he became an expert painter and owned a separate studio. The art of painting made Leonardo knowledgeable about anatomy and perspective. In addition to painting, Verrocchio’s studio also offered technical and mechanical arts and sculpture. Leonardo developed an interest in architecture so he went on to study engineering. His versatile and originative nature was born of a desire to promote creativity. After a decade of highly original work as an artist, Leonardo wrote to several wealthy men in 1482 to help finance his projects. The Duke of Milan, Lodovico Sforza (1452-1508), accepted his offer as Leonardo told him that he could design useful war weapons like guns and mines, and also structures like collapsible bridges. He lived in Milan with the Duke from 1482 to 1409, reportedly creating very innovational war machines. He also did painting and sculpture, as well as urban planning for large-scale water projects. His advice was sought for various projects related to architecture, military affairs and fortifications. There, he also wrote about making a telescope to view the moon. Most of Leonardo’s sketches and paintings depict a scientific phenomenon with an artistic and creative approach. On the other hand, his anatomical findings, including information about the structure of muscles and blood vessels, were surprisingly precise. His legendary masterpiece, Mona Lisa (1503-1506), is said to have an unusual smile which depicts how the muscles of the face function to make a smile. Leonardo also planned to create a mechanical flying machine. Leonardo discovered that flying, contrary to the popular notion, by attaching a pair of wings to a person’s arms and then flapping them like a bird, is simply not possible. He concluded that by using levers, the wings of a flying structure could be controlled. Leonardo also created a sketch of an early helicopter that even featured a preventive parachute. He, however, believed that his flying machines were not executable, partly because of his lack of knowledge about bird flight. As a result, he started studying animal anatomy, particularly of birds and bats. When France attacked Italy in 1944, Leonardo came back to Florence after the subsequent downfall of the Duke of Milan. After his return, he became fully engaged in mathematical studies. Leonardo also accepted an invitation by the Duke of Valencia, Cesare Borgia (1475-1507), to work as a senior military architect and general engineer. During his tenure, he analyzed geology and proposed to divert the Arno River and develop a canal that would allow Florence access to the sea. Leonardo was approached by King Francis I of France (1494-1547) who gifted him a beautiful and peaceful castle near Amboise in the Loire Valley. This is the place where he completed some of his unfinished paintings. Some of his undeveloped ideas also include designs for a canal to link up two rivers that would have made a water route from the Atlantic Ocean to the Mediterranean Sea. Leonardo foresaw that the world could be swallowed up by massive floods in the years to come. His brilliant series of drawings display water in violent motion. 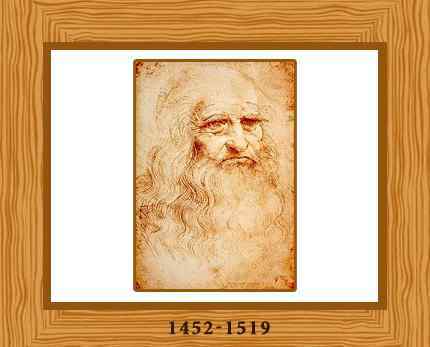 Leonardo da Vinci died at Amboise, Central France, on May 2, 1519. He was 67 years old.